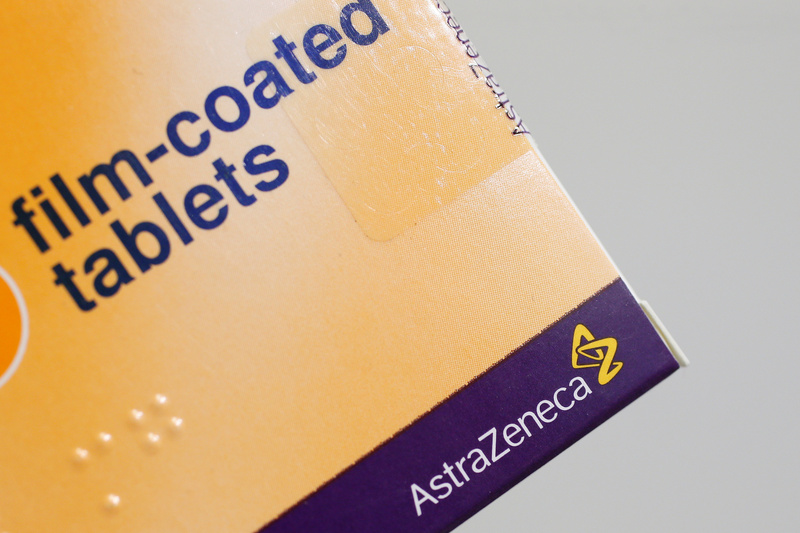 The logo of AstraZeneca is seen on a medication package in a pharmacy in London, Britain, April 28, 2014. AstraZeneca said on March 28 that it would pay up to $6.9 billion to Daiichi Sankyo to develop and sell a cancer drug developed by the Japanese company. The drug, called Trastuzumab Deruxtecan, allows chemotherapy products to target specific cancer tumours. It is being developed for certain breast cancer patients, and may also be used for lung and colorectal cancers. AstraZeneca will pay Daiichi Sankyo $1.35 billion upfront, with an additional $3.8 billion contingent on the drug clearing regulatory milestones, and $1.75 billion dependent on future sales. AstraZeneca also said it will raise $3.5 billion through a placing of new shares, of which more than half will be used to fund the transaction and the product’s future development. AstraZeneca shares were down 3.9 percent at 62.45 pounds by 0930 GMT on March 29. Daiichi Sankyo shares closed up 16 percent at 5,100 yen.